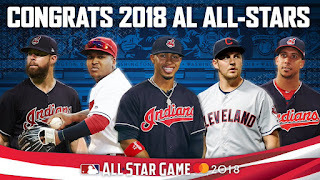 All Things Brantley, All Things Tribe: Brantley Named to MLB's 2018 AL All Star Team! Brantley Named to MLB's 2018 AL All Star Team! the happy news came tonight, on July 8 during ESPN's All Star Selection Show. Mookie Betts of the Boston Red Sox, Mike Trout of the Los Angeles Angels, and Aaron Judge of the New York Yankees are the starting outfielders for the American League team, which we basically already knew weeks ago. as soon as the very first AL All Star ballot updates came out, it was pretty apparent that those three would be starters. Michael was in 4th place on the fan ballot for the first two updates before he fell to 5th on the third released update. then, on July 2, MLB Communications posted one last voting update and Michael remained in 5th place. though he'd gained 299,302 votes since June 26, he was 48,285 votes behind George Springer of the Houston Astros and 927,972 votes behind 3rd starter Judge. Betts held a whooping 2,025,730-vote lead on Michael, who was only ahead of 6th place Andrew Benintendi of the Red Sox by 22,241 votes. Brant was never really in the running to start, sadly. be named an All Star in the past 10 years! previously, the last Tribe OF to go to an All Star Game was Grady Sizemore back in 2008, per TribeVibe's blog on tribevibe.mlblogs.com. Michael had a fantastic start to the year, playing exceptionally in both April and May. he even received AL Player of the Month votes for May. on the flip side, he had a pretty mediocre month of June and i thought maybe he'd lost his chance to make the ASG because of it. however, it dawned on me that there was a possibility that the MLB players might have started filling out their player ballots at the beginning of June, which was just after Michael's 19-game hitting streak and before his struggles. the fact that Michael has made a comeback from surgery for the second straight season probably didn't hurt and wasn't lost on the players either. aside from Michael, the other AL outfielders chosen as reserves are Springer, Mitch Hanigar of the Seattle Mariners, and Shin-Soo Choo of the Texas Rangers. six of the qualifiers had at least 8 more games played than Michael, so it shouldn't be surprising then that Michael's stats aren't exactly at the top. but when we look at everything in comparison to all the outfielders, well, it's not a pretty sight. before anyone says Michael shouldn't be an All Star and that other players were more deserving, i have to say that just because Michael isn't one of the league's home run leaders, it doesn't mean he's not All Star material. he still has great overall stats, especially when you remember that he opened the year late due to offseason right ankle surgery. he's a consistent hitter who typically bats over .300 when he's healthy and is one of the toughest players in baseball to strike out. outside of the numbers, he's also a team leader, a consummate professional who works hard and always exhibits a team-first attitude, and he's never let an injury keep him down. so yeah, i consider that to be of All Star-caliber. and his peers obviously recognize and agree with that assessment. if you want to see the different [AL OF] rankings and voting results on the fan ballot over the three weeks in June when results were published, just go to the All Star Voting Updates section of my Brantley's 2018 #s Through June blog. according to Jordan Bastian's Covering the Bases blog on bastian.mlblogs.com, manager Terry Francona was happy for Michael. "Brant, all that he's been through, i grabbed him and i told him, 'take a minute and enjoy this,' because he put a lot of work in. so, it's pretty cool." "it's kind of the same story as last year," Corey Kluber remarked. "he stayed here all winter to rehab and worked really hard and put himself in a position to go out there and be the type of player we all know he can be. to have that recognized is pretty cool, all the stuff that he does behind the scenes." and Francisco Lindor also noted the impact Michael's had on him. from T.J. Zuppe's twitter photo, he said, "Brant is like a dad. he's like a big brother. when i'm struggling, i go to him, or even when i'm going good, i just go up to him and say, 'hey, give me some knowledge today.' he's very special, i'm glad i get the chance to play with him day in and day out. and seeing how successful he has been even though he's had a lot of ups and downs, he never backs down from anything, he goes out there day in and day out, and i'm very proud of him." when Michael met with the media on July 9, he talked about being an All Star, going to the game with four other teammates, staying healthy, and the Indians picking up his option. from a video on cleveland.com's youtube channel, he began, "it's great. um, you know, to go out there and represent the Cleveland Indians and the great group of guys that we have going, um, it's a honor, it's a blessing, and uh, i don't take it for granted. uh, i'm very fortunate and very blessed to be in this situation and uh, i'm very appreciative to all the voters." how much more fun does it make it to go with four of his teammates? "it makes it a lot of fun. uh, my first year i was by myself, you know, i was a lot, i was a lot more quiet. uh, now that, you know, you can joke with the guys and, you know, you have your boys with you, uh, you get to enjoy the experience a little bit more." when Hoynsie asked what the key has been to him to staying healthy throughout the first half, Michael smiled and questioned, "the key? haha. i don't know if there's no special key, but at the same time, i'm coming in, you know, taking care of my body the best i can just like i did every year. um, doing the same preparations, just making sure that i go out there and, you know, do the best i can for my team as soon as i get on the field." "thankful that, you know, i'm back here, you know, in front of you guys as well. um, you know, to perform uh, i feel like i'm doing pretty well so far, so hopefully, and they made a good decision, right? but at the same time, but no, it's a blessing just to be out there. um, you know, it's the hard work that i put in. it's the confidence they had, you know, in me that i was gonna be able to come back, stay on the field, produce at a high level and, you know, impact this club to winning ballgames and, you know, so far, so good. we've got a long ways to go still and, you know, we got a postseason to hopefully, you know, run through and we'll see what happens then." Bastian's Pregame Minutiae blog on bastian.mlblogs.com had more of the session with Michael. is this selection more special than the other two? "i mean, i don't take it for granted. i think you've got to cherish each one for what it is. there's a lot of bumps in the road, a lot of highs, a lot of lows. you just kind of sit back when it's done and just kind of embrace it. it's not every day you get to go put on an All-Star uniform." will making the All Star team allow for him to get a break at all? "not really, but at the same time, you don't take it for granted. it's a lot of hard work that goes into it in order to be going to this game. so, it is what it is. but, at the same time, you've got to enjoy it the best you can, especially when you're going with the group of guys that we have in this locker room. that makes it even that much more special." when told that Lindor thinks of him like a dad, Michael laughed, "is that good or bad?" does he feel old? "i hope not. i don't feel that old. but, at the same time, he's a young kid that was coming up and i just wanted to do whatever i could to help him out, because veterans did that for me. so, you kind of pass it down--anything that i could. any questions that he has and to tell me or ask me and i give him the best answer i could. but, i hope i'm not a dad, yet. i mean, i have kids, but he's a little old to be my son." in addition, during Tito's pregame presser, he addressed, once prompted, the team exercising Michael's club option. "whatever he's making, it's really hard to go get that guy and for one year. it's not like somebody's going to come for one year. we were betting on him. if you're going to bet on anybody, [bet on Brantley]. we saw him first-hand, the work he was putting in to be healthy. i pulled him aside [after telling Brantley he made the All-Star team Sunday] and told him, i said, 'you take a minute and take this in, because you spent so much time back there working.' he was miserable and now he's an All-Star again. that's pretty special." Michael's not the only Indian headed to the Midsummer Classic. Trevor Bauer, Kluber, Lindor, and Jose Ramirez are also going to represent Cleveland in D.C. on the 2018 American League All Star team, too! Ramirez had the most votes on the fan ballot in the 3rd baseman category and therefore will be an AL starter for the second straight year. Lindor is a three-time All Star now, as he's gone to the ASG for three consecutive years. this is Kluber's third nod in a row as well, and Bauer is a first-time All Star. Kluber and Lindor were both selected via the players ballot, while Bauer was chosen by the Commissioner's Office as a replacement for Justin Verlander of the Astros. congrats to every Tribesman! the complete list of 2018 All Star participants can be found here. the winning league gets to split $640,000, which equals $20,000 per player.💰 (source: mlb.com.) let's go American League! are you satisfied with this year's All Stars? let me know who you think was snubbed and who shouldn't be on the team, either from the Indians team or other teams, in a comment below! the 89th annual All Star Game on Tuesday, July 17, at Nationals Park in Washington, D.C., airs at 8 pm ET on FOX in the US and Rogers Sportsnet and RDS in Canada. Labels: 2018, AL outfielders, AL reserve, All Star game, All Star Selection Show, ballots, Cleveland Indians, Dr. Smooth, ESPN, July 17, July 8, LF, Michael Brantley, OF, outfielder, results, Tribe, votes, Washington D.C.
Brantley's 1,000th Major League Game! Brantley Acquires 500th Career RBI!